HeyPlantMan! 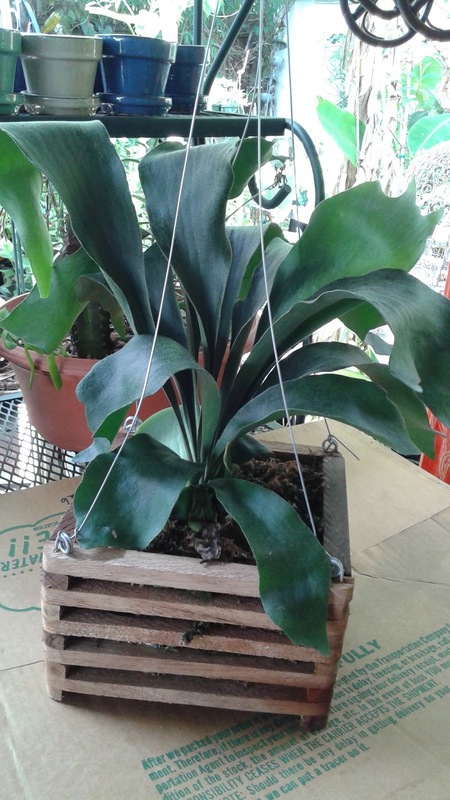 Exotic Tropical Plants from St. Pete FL: Getting Boggy - Bog Plants, that is ! Revision ! 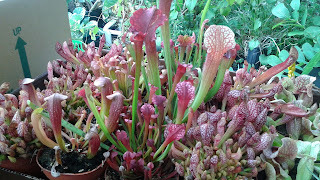 Getting Boggy - Bog Plants, that is ! Revision ! Hello all, seems there was a bit of computer glitches in my posting from earlier today, please see our revised cop y ! Greetings all, we just got back from a little road trip and The Plant Hunter, Mitch, and his Gal, Annie, found some pretty cool new things for our Market day tomorrow ! 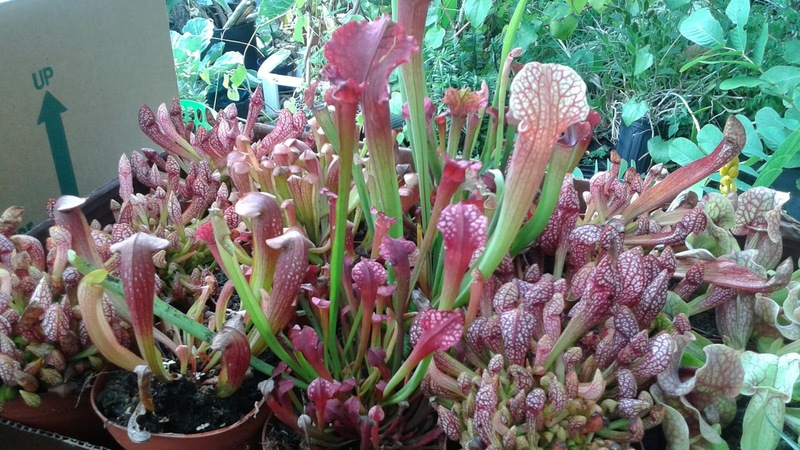 These are commonly known as "Bog Plants"
These are different types from the genus Sarracenia, and they are very cool looking, love moisture and capture bugs ! These love bright light and can take direct sun, or very bright shade. You grow them in small pots or you can start yourself a Bog Garden ! 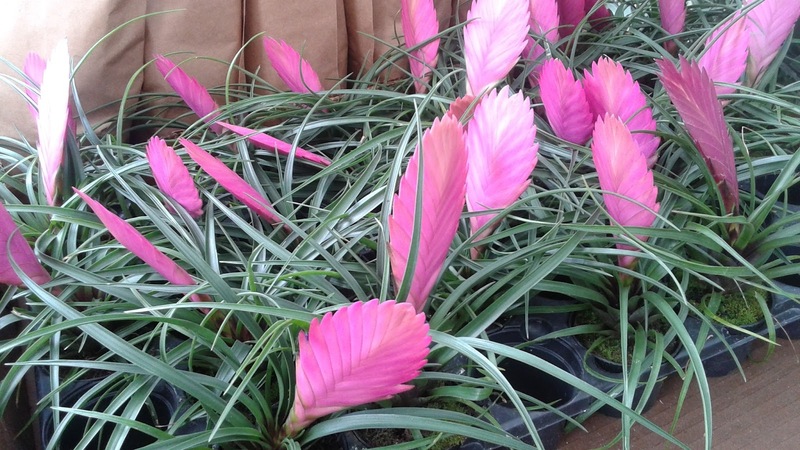 These are little Tillandsias that produce these gorgeous bright pink quills. 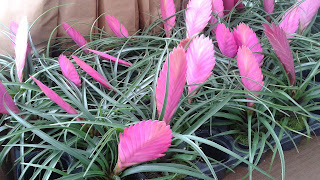 You use them just like other cool Air plants by placing in shady spot in gardens, attach to wood etc, or just place them in a waterless vase or container. 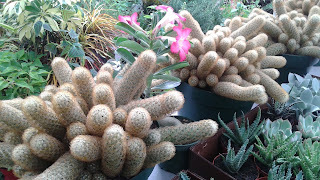 We came back with lots of new fresh Mini Succulents and Cacti, and, these huge 6 inch pots of this cacti called "Lady Finger" ...its a soft cactus and produces gorgeous teeny little flowers. One of the easiest cacti to grow and it won't hurt your fingers ! We also have them in 4 inch minis. Our customers have been asking for Staghorn Ferns and we found some gorgeous ones in beautiful wooden baskets - some of the nicest specimens we have had for quite some time, and best yet, you don't have to do anything to them - just find a shady place to hang ! That is just a few examples of some pretty cool new stuff for your gardens. We will be back at Williams Park Summer Market tomorrow, July 9th, in our usual spot, bringing you some great exotics and more. Don't forget, our immediate neighbor at market, Tropical Glass Creations (aka, the Steve and Kim show!) are closing out their Glass art and jewelry business, and they are having some mind blowing great sales on their products, so be sure to visit them ! And while you are there, visit their new enterprise they are going into the fold in, Its Our Nature, organic clothing and hats, right next door.